Like Brie, Camembert is made in wheels of various sizes. Its flavor is a little more pronounced than Brie. Deep fried in beer batter, it makes a taste tempting snack and hors d’oeuvre. Discover the versatility of sauerkraut and add a healthy touch to your pizza with the following tasty supper treat. Perfect for those cool fall evenings! By “comfort foods,” we mean feel-good, hearty, dishes that remind us of that comfortable “at-home” feeling — dishes such as meatloaf, chili, mashed potatoes and macaroni and cheese, that mom and grandma used to make. We all crave these foods from time to time, especially when the winter time comes around. For a little winter comfort German-style, try this tasty and veggie-rich alternative to “Mac ‘n Cheese” using German Spätzle noodles. Our colorful “Stuttgarter Spätzle” is pleasing both to the eye and to the tastebuds and is sure to warm even the most dampened spirits! 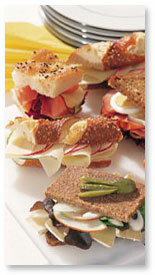 German breads, meats and cheese for a party sandwich platter with garnishes. This is the kind of party food that makes entertaining easy — rich, satisfying, easy to make and serve.